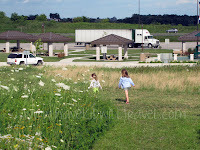 Two miles south of the Iowa border along I-35 southbound sits a new rest area. It is rather over-named the Eagleville Welcome Center and Rest Area but it is a really nice rest area- especially if you have kids and the weather is nice. The first thing we noticed was the tall grass “pet area” behind the building. It’s more than a pet area. Some of the grasses are mown to create walking paths back to the scuptures- which appear on the horizon of this photo as small, dark figures. 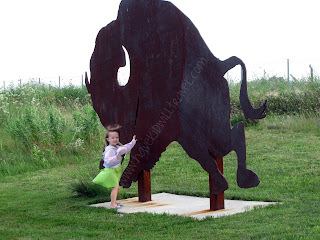 Up-close and personal visits show the buffalo roaming on the plains and a Native American on horseback. It’s art that actually makes sense. The girls had a great time running through the grass and burning some energy after a couple of hours in the car- with a couple more to go. Another great addition if you have kids is a small play area. Send the kids over to climb and slide before you all load in the car and continue on your way.